The FMA2700/FMA2800 Series Electronic Mass Flow meters and FMA3700/FMA3800 Mass Flow Controllers provide high flow measurement performance and versatility. Omega’s new inline series features a “flow-through” zero dead space design for quicker processing and lower contamination. Available with onboard display and wall mounted power supply, the inline series is ideal for laboratory and test applications. 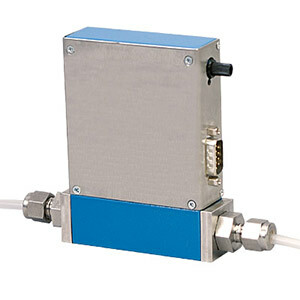 Compact, lightweight and economical, the FMA2700/FMA2800 Series Electronic Mass Flowmeters and FMA3700/FMA3800 Mass Flow Controllers are perfect for gas flow application which require and all stainless steel construction. 참고: Comes complete with operator's manual, 9-pin sub-D connector, power supply and 5-PT NIST calibration. For a 10-point NIST certificate add suffix "-NIST10" to model number, add $175 to price.